Strawberries are considered the staple fruit of the summer. One main pillar in strawberry production is finding a way to supply these fruits year-round. A country that can do that, has gained a major foothold in the strawberry business. With the demand of strawberries increasing every year, farmers all over the world are looking for cheaper ways to produce their fruit. In this post, we are going to look at Argentina and California; locations that benefit from unfair labor practices in order to decrease their costs of production. We are going to identify the demand for these labors, the conditions in which these workers are subjected to, and lastly we are going to dive into some of the movements towards eliminating child labor in this industry and what can be done to improve them. South American countries only account for about five percent of the world’s strawberry production since the northern hemisphere doesn’t really need strawberries from South America. 80% of the strawberries consumed by the United States alone were produced in their own states, while the other 20% is imported from Mexico. In order for South American countries like Argentina to compete with other exporters, they severely reduce their production costs. Why are strawberries so much cheaper in South America? Well, they’re using children as harvesters and paying them almost nothing, significantly driving down their labor costs. The United States is the world’s largest producer of strawberries. In 2014 alone, the United States produced three billion pounds of strawberries. 70% of these berries came from 41,500 acres in California with a yield per acre of 50,500 pounds. That is a lot of strawberries! California has the perfect climate for strawberry harvesting which allows for a year-round growing season, effectively making it the best state for production in the U.S. The Bracero Program , which was talked about in-depth by Amanda Kennedy, really set the precedent for California’s reliance on Mexican immigrants for harvest production. Without being repetitive of her article, I’d like to emphasize that almost five million workers were brought into the United States through this program. The program did not give workers any control in labor incentives, but provided farm owners with unprecedentedly cheap labor. And of course, unions and labor protections were not allowed at this time. The strawberry industry specifically benefited from the Bracero program because migrant workers were forced to work positions deemed “unattractive” to domestic workers. Because these laborers were working for so little pay, the precedent that farm laborers should be paid low agricultural wages was set. This mindset continues today, as farms in California continue to reach their labor demands by using workers willing to accept pay rates lower than their domestic counterparts. According to the International Labor Organization, more than 450,000 children under the age of 17 are working in agriculture in Argentina. 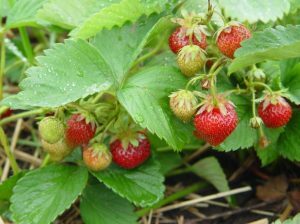 They are specifically utilized on strawberry farms due to their small hands that don’t bruise the berries, and the fact that they can easily reach the berries, which grow low to the ground. Children working on these farms are exposed to dangerous pesticides for extremely long hours, in fact, strawberries were recently named #1 in the Environmental Working Group’s “dirty dozen” list (produce with the most traces of pesticides). Some children aren’t paid at all when they work if they are working with their parents, while others are working off debts that will never be fully paid. Very few child workers attend school on a regular basis, and most have completely given up school altogether. 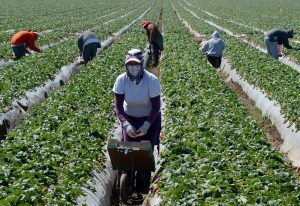 Due to the time sensitive nature of the strawberry harvest, California employers rely heavily on the labor of migrant workers. Of the migrants in California today, anywhere from 30 percent to 60 percent, depending upon the crop, are illegal immigrants. Children of these workers also tend to accompany their parents when they are not enrolled in school in order to increase the family income, some will even come to work and forgo school entirely. Strawberry harvesters are often paid on a piece rate wage. Meaning workers get paid based on the amount of “units” they can produce. It’s a convenient system for agriculture because it’s easily measurable and it’s characterized by repetitive actions. However, daily earnings are calculated by individual worker productivity, so a slower worker can pick berries for the same amount of time (sometimes 13 hours a day), yet get paid much less than their faster counterparts. In 2012 the Argentinian government passed legislation that would penalize employers who utilized child labor on their farms. They implemented the National Plan to Combat Child Labor, which was made to administer social programs to unemployed populations in need. One of those social programs provides students with grants to attend school, aiming to steer kids towards an affordable education and away from work in the agricultural sector of the country. This could be an effective program because it focuses on what pushes these children into entering the labor force early. Another effective social program also looks to change the cultural mindset that normalizes working at a young age to help parents. The program looks to create job opportunities for parents of at-risk children, so the kids don’t feel like they have to get a job to provide for their families. Argentina also took a step in the right direction with a new legislation that establishes the minimum legal age of employment to 16. They also conducted their first national survey of child labor, which was carried out in order to gain a scope of how big their problem is. Establishing the minimum employment age was a long needed legislation. One hole in the law is that it allows workers ages 16-18 to work until 10pm. This authorization exposes these kids to the sexual exploitation risks associated with night work. The national survey of child labor was a major step in the right direction for Argentina, however the survey did not include rural areas. While urban areas do account for the majority of the violence toward child workers, rural areas allow for the isolation of these kids in private homes. This isolation makes them more susceptible to physical and sexual abuse with no one there to intervene. Adding data from rural areas could have given them a more accurate view of the country’s labor problems as a whole. An underlying critique of all of these solutions is that they do not directly attack the demand for strawberries in the first place. Nor do they hold consumers accountable for purchasing strawberries from these locations. What would happen if we held consumers accountable? 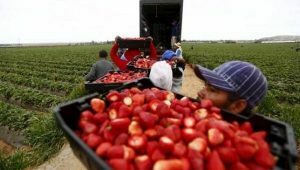 With a recent crackdown on illegal immigration, strawberry farmers in California may be looking at unharvested fields. Employers depend so highly on migrant workers, that deportations are already leading to the loss of employees. The theory was that by cutting off the flow of immigrants, more jobs would be offered to American-born citizens. Well, that didn’t really work. Some independent farmers increased their wages as they lost more employees, marketing themselves even more to native-born Americans. But frankly put, American workers are not willing to do the hard labor that comes with picking strawberries, even if the pay is above minimum wage. This “solution” to the immigration problem really only forces the American strawberry industry to realize how heavily they rely on the work of so-called “illegals”. The demand for strawberries has gone up 13% in the past few years. People are buying more strawberries and have no idea (or don’t want to know) the true way in which they are harvested. I would suggest a regulation that shows consumers how our food is brought to us, to deter us from buying from these particular farms. For the migrant workers in the U.S. who harvest strawberries to make a living, I’d suggest getting rid of the “piece-rate wage”. The piece rate wage makes it much harder for slower workers to even make it to minimum wage if they aren’t able to collect as many berries as others. These workers are getting paid wages that are impossible to make a living out of! US consumers demand cheap food, in fact, we expect it. And agribusiness corporations meet our demands by underpaying workers, over-spraying crops and supporting trade deals to import food from countries with awful child labor conditions (hello, Argentina). “People don’t want to pay more than $1 for a head of lettuce. So we’re paying poverty wages. It’s a broken system.” said fourth -generation strawberry farmer Phil McGrath. 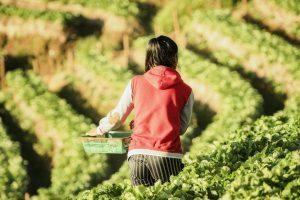 Laws that require agriculture employers to report their labor conditions on a regular basis. And stricter punishments for not reaching criteria. 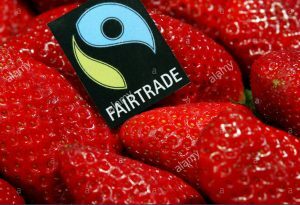 Regulations for strawberry manufacturers to be responsible for printing labels that provide information about where these specific strawberries were picked and how. And the continued demand for organic produce! The consumer holds the power. It’s our money that is fueling this demand, we can begin challenging this industry to take better care of their workers. Posted by hoosier.3 at 5:55pm Bookmark the permalink.